Ebedi Review is a beautifully packaged publication that focuses on literature, writers, books - and of course the pertinent Residency programme, based in Iseyin, Nigeria. Shaitans) and Paul T Liam, assiduous poet and essayist. The founder and patron of the Residency and journal is Wale Okediran. Okediran, who is also one of Africa's top writers and authors,looms large, even in this publication. Author of well over a dozen fine works, even in his shorter pieces and contributions (many of them published here) he continues to show what a dexterous writer he is. Residency...dissolved and wafted away in the embers of that lovely night." (Page 66). their best to publish contributions from all over Africa, though the majority of work is from Nigeria and west Africa. We have a lovely piece written by Barbara Oketta, from east Africa (page 25); and from southern Africa we have contributions from Raphael Mokoena (Lesotho)and Tiisetso M. Thiba (South Africa). There are scores of poems, general essays, reviews, reflections,vignettes et al, published in the Review. It is touching that at least two deceased, iconic writers are celebrated here: Flora Nwapa, and Elechi Amadi. Many of the general essays or presentations bristle with authority and authenticity. Nel Ibuola eg reviews Tendai Huchu's work impressively; as does Mokoena with Bolaji's work, Cognoscenti. academics or scholars, many of them are professionals in other fields who are gifted with creative talent. They may not need tutoring or mentoring, but certainly they would need socialization and to acclimatize in the creative writing environment. "The idea of a Residency is to offer such services to writers from different educational and professional backgrounds... Writers need a forum for informal self-assessment," (page 69). 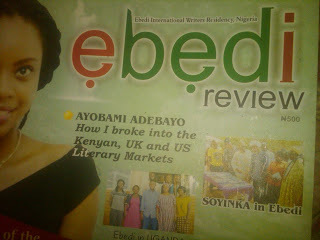 Ebedi Review, which has packaged and distilled the collective talents and experiences of sundry writers and artists here, more than whets the appetite. Thank you once more and I'm grateful to see my name here. It's an encouragement.